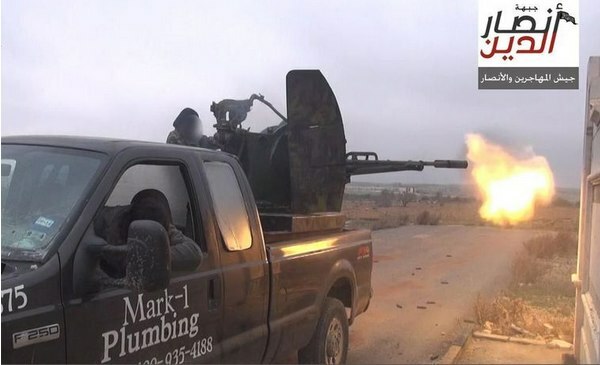 I initially posted about this Texas plumber’s truck which ended up being used by ISIS as an anti aircraft artillery platform in Syria on the day the story broke, but pulled the report because of a claimed pedigree by Glenn Beck which explained how that truck got to Syria. But on close examination, Beck’s story is a b.s. white wash with no root in facts whatsoever. Here is a far better explanation for how a nearly worthless worn out used truck was deemed worthy to ship overseas, and it has U.S. military intelligence written ALL OVER IT. It is no small issue to ship a vehicle across the Atlantic, through the Mediterranean and drop it off at Syria. To justify such a trip, which would no doubt involve one or more shipping transfers, a high vehicle value has to exist to provide a reason for shipping it to begin with. A worn out plumber’s truck simply would not cut it. There are many many higher value used vehicles available in Syria and the rest of the Arab world, which nullify any rational reason to ship something that is used for that great a distance. The only cars that can be by force of economics shipped that distance are classic cars, new cars, or very odd circumstance high value used cars. “Plumber’s castaway” is not on that list. However, there is ONE WAY that a HUGE number of very low value cars get shipped overseas economics be damned, and that is as privately owned vehicles that BELONG TO THE MILITARY. Once you are a U.S. government employee, especially Army Navy Air Force Marine Coast Guard, your car gets shipped absolutely FREE, sight unseen, even if it is worth less than scrap value. Buck Private Bob bought a truck at an auto auction CHEAP. Buck Private Bob got assigned to Syria. Got a security clearance for black ops. HAD THE ARMYAIRFORCENAVYMARINESCOASTGUARD (whatever) ship his truck overseas FREE. Buck Private Bob (now a Spec4) for whatever reason used his truck in an ISIS photo op. And even if it was not shipped over there as a privately owned vehicle and was bought by a black op contractor or whatever for use in Syria, THE ONLY THING THAT CAN ECONOMICALLY EXPLAIN HAVING AN OLD PLUMBER’S TRUCK END UP IN SYRIA IS FREE SHIPPING BY THE U.S. MILITARY, which happens all the time. No mystery there! And so many people know this that Beck had to put his finger in the dike to prevent a flood of public awareness of the ISIS scam. Dear Glenn Beck: This truck blows a huge hole in the ISIS psy op, only the U.S. government would ever get it there, HOW THE HELL DID YOU MISS THAT? That truck never got shipped overseas. Not by the military, not by U-DO-IT-FREE truck transport, NO, it just sat in Texas. Got bought at an auto auction cheap, AND ALL THE BEHEADINGS, ALL THE ISIS PHOTO OPS WERE SHOT ON A MILITARY BASE IN TEXAS WITH ORDINARY USED AMERICAN VEHICLES. How about that? That make sense? Are there good enough “Arab back drops” available in Texas? I THINK SO! This truck most likely simply busted the fact that much of ISIS, if not all, is happening on American soil hollywood style and the American bombings in Syria are done against ONLY what America wants wiped out in Syria. Makes perfect sense when ISIS is an American military intelligence outfit running in Washington DC with major offices in Texas.